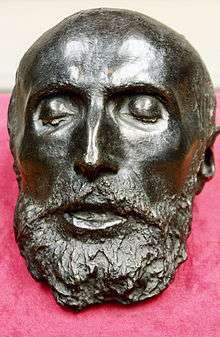 The death mask of Antoine Wiertz. Antoine Joseph Wiertz (22 February 1806 – 18 June 1865) was a Belgian romantic painter and sculptor. In 1828, Wiertz came out second in the competition for the prestigious Prix de Rome which he attained on his second attempt in 1832; it enabled him to go to the French Academy at Rome, where he resided from May 1834 until February 1837. Upon his return, he established himself in Liège with his mother. During his stay in Rome, Wiertz worked on his first great work, Les Grecs et les Troyens se disputant le corps de Patrocle ("Greeks and Trojans fighting for the body of Patroclus", finished in 1836), on a subject borrowed from book XVII of Homer's Iliad. It was exhibited in Antwerp in 1837, where it met with some success. Wiertz submitted the work for the Paris Salon of 1838, but it arrived too late and was refused. 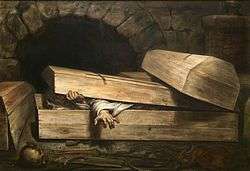 Many of his works from the 1850s have a social or philosophical message, often translated in delirious imagery, like Faim, Folie et Crime ("Hunger, Madness and Crime", 1853), La Liseuse de Romans ("The Reader of Novels", 1853), Le Suicide ("The Suicide", 1854), L'Inhumation précipitée ("The premature burial", 1854), Le Dernier Canon ("The last gun", 1855). 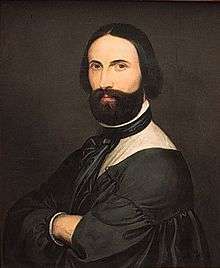 Wiertz was also a fine portrait painter, who made self-portraits at various ages. As a sculptor, he produced his most important project towards the end of his life: a series of plasters representing Les Quatre Âges de l'Humanité ("The Four Ages of Humanity", 1860–1862), reproduced in marble for the Wiertz museum by Auguste Franck. A copy of one of Antoine Wiertz's works, the statue of The Triumph of Light was once prominently located high on San Francisco's Mount Olympus between the Haight-Ashbury and Corona Heights. It had been presented to the city of San Francisco by Adolph Sutro in 1887. Over the years due to lack of care and maintenance the statue fell into disrepair. By the late 1930s, even the history and origins of the statue were no longer common knowledge in San Francisco, and by the mid-1950s, the statue disappeared. All that remains today is the pedestal and base of the monument. Main hall of The Wiertz Museum, Brussels. ↑ "The Antoine Wiertz Museum". Royal Museums of Fine Arts of Belgium. Retrieved 9 October 2016. ↑ Dunford, Martin; Phil Lee (2002). The Rough Guide to Belgium & Luxembourg, 3rd ed. Rough Guides Limited. p. 101. ISBN 1-85828-871-1. Retrieved 16 August 2009. ↑ Cole, Geert; Logan, Leanne (2007). Lonely Planet Belgium & Luxembourg, 3rd ed. Hawthorn, Vic., Australia: Lonely Planet Publications. p. 86. ISBN 978-1-74104-237-5. Retrieved 16 August 2009. ↑ "A Belgian national champion. A terrible lesson from a terrible painter". The Economist. 9 July 2009. Retrieved 16 August 2009. Berko, Patrick & Viviane (1981). "Dictionary of Belgian painters born between 1750 & 1875", Knokke 1981, p. 792-793. Berko, Patrick & Viviane (2011). "19th Century European Virtuoso Painters", Knokke 2011, p. 520, illustrations p. 430. Wikimedia Commons has media related to Antoine Wiertz.